The Tasmanian Breath of Fresh Air (BOFA) Film Festival brings great stories and people together. We’ve searched the world for stories that intrigue, inspire and invite conversation. BOFA is an annual event running over three days in Hobart (10-12 May, 2019) and over four days in Launceston (16-19 May, 2019). BOFA is about ideas and change. We’ve found films that question today’s world and how we, its citizens, choose to live in it. BOFA is about personal challenge. We’ve gathered stories of the ways we test ourselves in life, in love and in the wild. BOFA is about community. A Day on the Kingsway food and wine festival, screenings in pop-up venues and the inspiring Action Sessions bring the community together to eat, drink, talk and enjoy. BOFA is serious about having fun. Join us at the Village Cinemas, in the heart of Launceston and Hobart. We’re laying out the red carpet, putting on parties every night and screening in comfortable theatres with the highest quality projection. 2019 film lovers can choose and enjoy favourite stories from STAR STUDDED – Showcasing award winning films and stars of the screen. 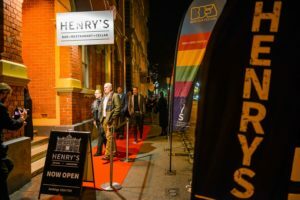 STORIES OF US – The best of Tasmanian and Australian films telling the stories of us WORLD STORIES – Outstanding stories from the world’s best film festivals. EAT/DRINK/LIVE – From the fine food/wine centres of the world to sustainable living in Australia. CHANGING WORLD – Docos and features that take a deeper look at the way our world is changing around us. CALL OF THE WILD – Stories of extreme adventures in the mountains, the sea and the air. STRONG WOMEN – Inspiring stories of strong women in film and in life. NEAREST NEIGHBOUR – Indonesia, 0ur nearest neighbour can be a bit of a mystery but these stories will intrigue, inspire and inform. There are many ways that volunteers can help with BOFA, from behind-the-scenes administration to VIP hospitality at the Festival in November. We need everything from ushers to smile and welcome our guests, to muscular types to haul stuff, to specialists who understand the mysteries of computers, exhibition stalls, lighting, music, you name it. Stewards and volunteers receive free film passes, T-shirts, refreshments and entry to celebrations. We believe a partnership with your organisation is about nurturing your connection with your target customers by putting their needs first. BOFA is happy to customise a sponsorship package which could include some or all of the following: Branding, advertising and promotional messages, hospitality, client/customer perception building (via an enhanced festival experience), product placement, and/or fund raising. Partners can “own” a whole part of the film festival or could just support one film or event. Let’s talk about how BOFA can leverage your business. Call Owen Tilbury on 0407 501 287. Only part of the film festival is funded by ticket sales. BOFA needs corporate benefactors as sponsors to tax-deductably support the running of this ambitious event. This can come in terms of in-kind or financial support. As a sponsor you are invited to attend films and parties as our guest, plus meet the various industry guests. Sponsorships are tax deductible business expenses. We will provide you with tangible publicity and business benefits worth significantly more than your investment. If you have “made a dollar” and would like to make a difference with it, now is the time to talk to us. Call Owen Tilbury on 0407 501 287.